Dr. Topalian received her medical degree from the Tufts University School of Medicine and completed a general surgery residency at the Thomas Jefferson University Hospital in Philadelphia. She was a research fellow and then a Senior Investigator in the National Cancer Institute, NIH. She joined the Johns Hopkins faculty in 2006 to become the inaugural director of the Melanoma Program in the Kimmel Cancer Center. 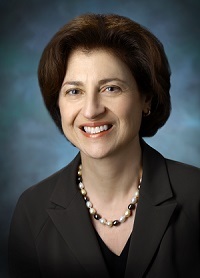 Dr. Topalian is a physician-scientist whose studies of human anti-tumor immunity have provided a foundation for the clinical development of cancer vaccines, adoptive T cell transfer, and immune-modulating monoclonal antibodies. Her current research focuses on manipulating “immune checkpoints” such as PD-1 in cancer therapy, and discovering biomarkers predicting clinical outcomes. Her work has opened new avenues of scientific investigation in cancer immunology and immunotherapy, and has established this treatment approach as a pillar of oncology. Dr. Topalian has received numerous awards for these contributions. She was named one of Nature’s 10 in 2014. In 2015, she received the Karnofsky Award from the American Society of Clinical Oncology, the Estela Medrano Memorial Award from the Society for Melanoma Research, and the Dr. Thierry Jahan "A Breath Away from the Cure" Award from the Bonnie J. Addario Lung Cancer Foundation. In 2016, she has received the Women in Cancer Award from Practical Recommendations in Immuno and Molecular Oncology (PRIMO), has been named to "the one hundred" at the Massachusetts General Hospital Cancer Center, and has been elected a member of the Association of American Physicians. She is a member of the American Association for Cancer Research Task Force on Regulatory Science and Policy, the Melanoma Research Alliance Board of Directors, and the Society for Immunotherapy of Cancer's Board of Directors.